1.Battle Of The Giants! Mainwaring is under pressure. At the ceremonial church parade he is the only one without a medal to wear – even Pike has a boy scout badge. Ridiculed by Captain Square, he has no option but to challenge the Eastgate platoon to a series of initiative tests. With the vicar, the verger and Mr Hodges as judges, the platoon races to hoist their flag from the church tower. 02. My Brother And I: As Mainwaring prepares t.. It is 1944 and World War II is reaching its climax. The Allies are poised to invade France and finally defeat the German army. But in Walmington-on-Sea morale amongst the Home Guard is low. Their new mission then – to patrol the Dover army base – is a great chance to revive spirits and reputation, that is until glamorous journalist Rose Winters arrives to write about their exploits, setting the pulses racing and putting the local women ..
British war comedy based on the BBC television sitcom directed by Oliver Parker. Set in 1944, leading on from the end of the television series, the film follows glamorous journalist Rose Winters (Catherine Zeta-Jones) as she is sent to report on the Walmington-on-Sea Home Guard, which has been suffering from low morale. Shortly after, however, MI5 discovers that a German spy is hiding in the town, giving the platoon a chance to effect r..
All nine surviving episodes from Series 1 and 2 of Jimmy Perry and David Croft's classic BBC wartime comedy based around the Home Guard in Walmington-on-Sea. In 'The Man and the Hour', bank manager Captain Mainwaring (Arhtur Lowe) is put in charge of Walmington-on-Sea's new Local Defence Volunteers platoon. 'Museum Piece' sees the men in training with only fifteen carving knives and a shotgun to defend themselves against a Nazi invasion..
Own Dads Army Series 1 to 9 Complete Collection DVD from Deff, DVD, Blu-Ray & 4K Video Specialists - Free UK Delivery..
1. The Armoured Might Of Lance Corporal Jones: Lance Corporal Jones allows the platoon to use huis butcher's van as an armoured car and Mainwaring meets the new ARP Warden - Hodges the Grocer. 2. Battle School: The platoon goes on a weekend guerilla-warfare exercise. If they ever manage to find it, they have to capture Captain Rodrigues' HQ. 3. The Lion Has Phones: When an enemy aircraft crashes in the town's reservoir, the platoon has .. The Big Parade: Captain Mainwaring has reservations about letting Private Walker supply the platoon's mascot for the big 'Spitfire Week' parade. Don't Forget the Diver: On an exercise, Walmington-on-Sea platoon come up with an ingenious plan to capture the windmill defended by the Eastgate men. Boots, Boots, Boots: Captain Mainwaring implements an unpopular series of lengthy marches to achieve the three Fs - fast feet, functional feet..
Own Dads Army Series 5 DVD from Deff, DVD, Blu-Ray & 4K Video Specialists - Free UK Delivery..
1. Deadly Attachment: A German U-boat crew are found adrift in a dinghy. At the church hall, Mainwaring and his men are given the task of guarding them, but the roles are soon reversed when Corporal Jones is caught in an awkward position. 2. My British Buddy: Mainwaring arranges a darts match to welcome a party of American GI's to Walmington-on-Sea. But the appearance of some local ladies soon causes the welcome to turn sour. 3. The R..
Own Dads Army Series 7 DVD from Deff, DVD, Blu-Ray & 4K Video Specialists - Free UK Delivery..
1. Ring Dem Bells: Mainwaring is delighted when the platoon is selected to appear in a training film, but not so pleased to discover they are to play Germans - with Pike and Wilson as the officers. 2. When You've Got To Go: Private Pike's call up papers have finally arrived. despite his mother's claims that he is too delicate, it seems that Pike is really ready for the regular army... 3. Is There Honey Still For Tea? 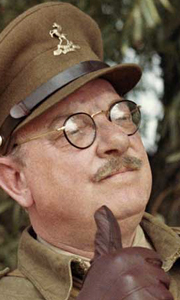 : Godfrey's lovely..
Captain Mainwaring and his men create comedy mayhem when they go on manoeuvres with other military companies under the eyes of a real Major-General. The result is disaster after disaster.... After the shambles, the Walmington-On-Sea defenders return home just as a German scout plane crashes near their town. Its crew captures the Church Hall and holds the vicar and Mayor as hostages. The Major General sends the Army, the army sends for t..
Five episodes from the classic sitcom. In 'The Deadly Attachment' the platoon are given the task of guarding a captured U-boat crew. 'Keep Young and Beautiful' finds Captain Mainwaring's men engaged in some rejuvenating activity. 'Never Too Old' sees Jones indulge in some bizarre behaviour after falling in love. 'Asleep in the Deep' has the team get into trouble when a bomb lands on the local plumbing station. And 'Sons of the Sea' find..
Own Dads Army - The Very Best Of - Volume 2 DVD from Deff, DVD, Blu-Ray & 4K Video Specialists - Free UK Delivery..